easyJet celebrated Shakespeare’s 450th anniversary by staging an abridged version of his complete works during a flight from London Gatwick to Verona. 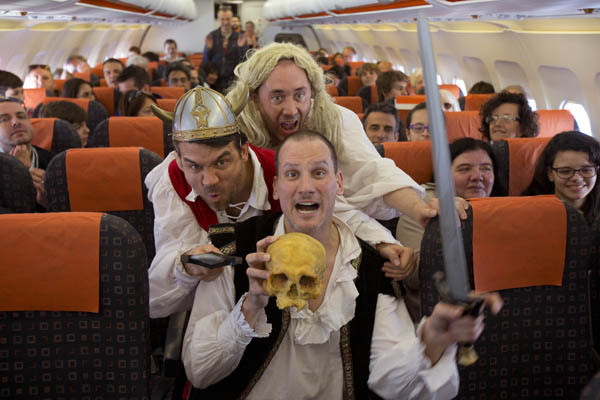 The performance, by The Reduced Shakespeare Company lasted an hour and the airline has submitted it to Guiness as a potential World Record for the “World’s highest theatrical performance.” The live performance is part of a wider easyJet campaign to make 23 April National William Shakespeare Day. 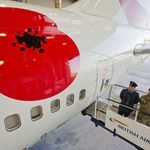 Heritage and culture remain an important driver of tourism to the UK and the airline has run a month long campaign to promote the best Shakespearean sites to UK visitors as well as staging free performances of the playwright’s work at check in desks. 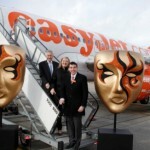 The production took place aboard a special edition easyJet plane complete with a ten foot image of the Bard on the fuselage. Three actors from the Reduced Shakespeare Company performed at the front of the aircraft and have been rehearsing in easyJet’s Luton training centre in preparation for the unique show.